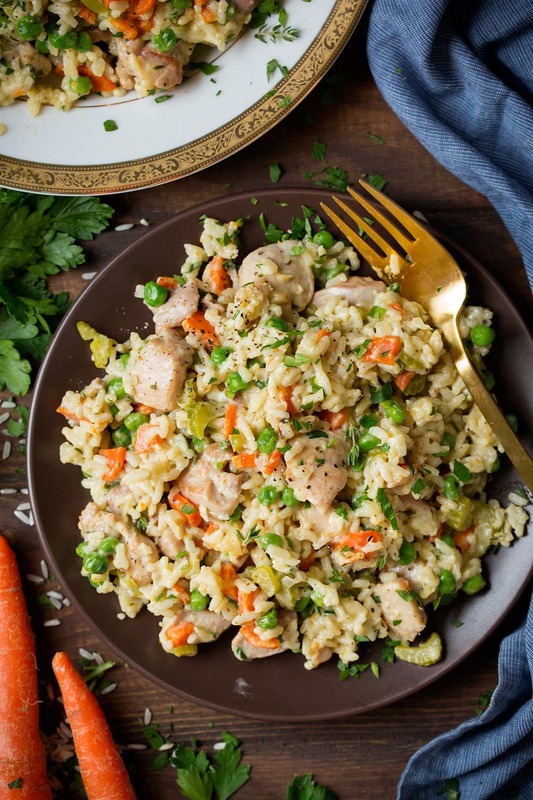 Creamy Chicken and Rice is one of the heartiest, most comforting dinners and it’s absolutely perfect for cold fall days! 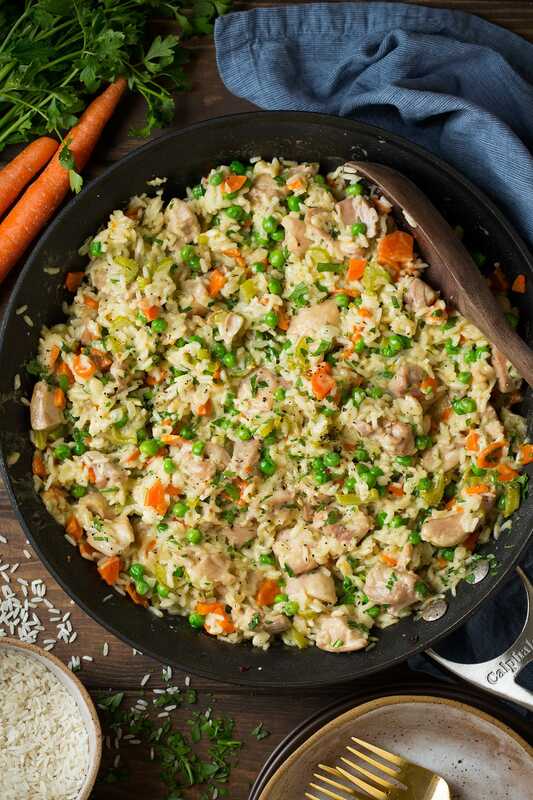 Rice, veggies and chicken are all cooked together in a creamy broth for a satisfying dinner in one. 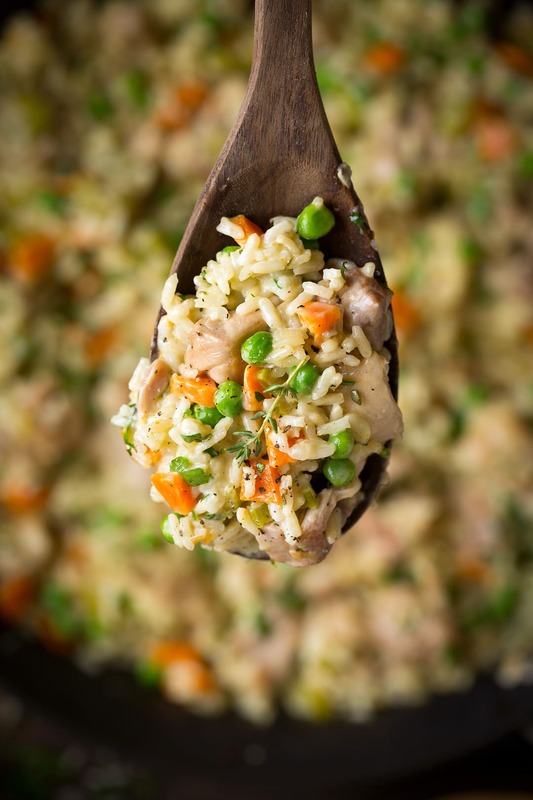 This chicken dinner is one of those recipes that the whole family can agree on. The flavors are simple enough for the kids but the flavors are delicious enough to satisfy adults too. It’s just straight up delicious cozy comfort food. 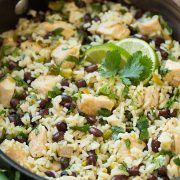 And as mentioned in the recipe title, it all cooks in one pan so clean up is easy breezy. Plus it gives the flavors all a chance to meld since everything is cooked together. Yum! Saute onion, carrots and celery in oil. Transfer to a plate. 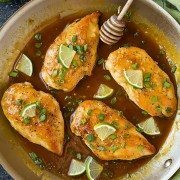 Cook chicken in skillet, adding garlic near the end. Add in rice, chicken broth and thyme and season with salt and pepper. Bring mixture to a boil then cover and simmer until liquid has been absorbed and rice is nearly tender. 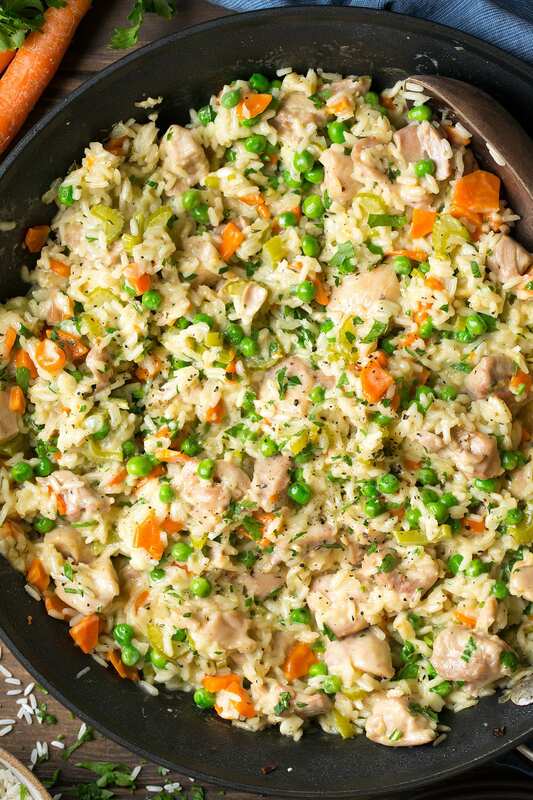 Stir in peas and cream, cover and cook until rice is fully tender. I know some of you are probably wondering about using chicken breasts here. That’s fine but I do think the thighs are best here as they have more flavor. Do note that if you are using chicken breasts I definitely wouldn’t cook them entire time, as the thighs do. Cook breast pieces fully first then wrap in foil and keep warm and mix in at the end. Over-cooked chicken breasts wouldn’t do this recipe any favors. Can I Use Dried Herbs in Place of Fresh? You can substitute dried herbs for the fresh and feel free to use both the rosemary and thyme if you like a lot of herbs. Do I Have to Use Cream? I highly recommend that you don’t leave out the cream and substitute with broth. We’ll all need a comforting meal now and then and the cream makes it so good! Feel free to add more parmesan if you like it extra cheesy. 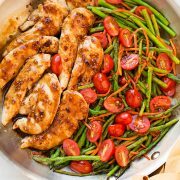 A hearty, comforting and perfectly satisfying one pan chicken dinner that everyone can agree on. Perfect for cold fall days! Heat 1 1/2 Tbsp olive oil in a 12-inch skillet over medium-high heat. Add onion, carrots and celery and saute until tender, about 8 - 9 minutes. Transfer to a plate. Heat remaining 1/2 Tbsp oil in same skillet over medium-high heat. Add in chicken and cook 3 minutes. Add garlic and cook until chicken is nearly cooked through, about 2 minutes longer. Add in rice, chicken broth and thyme and season with salt and pepper to taste. Return veggies to skillet. Bring mixture to a boil then reduce heat to medium-low. Cover with lid and simmer until liquid has been absorbed and rice is nearly tender, about 18 - 20 minutes. 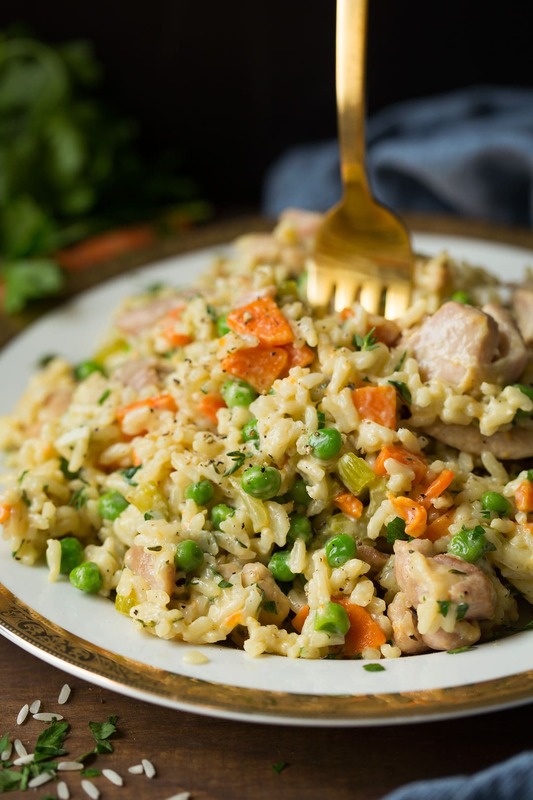 Stir in peas and cream, cover and cook until rice is fully tender, about 5 minutes longer. Stir in parmesan and parsley. Serve warm.